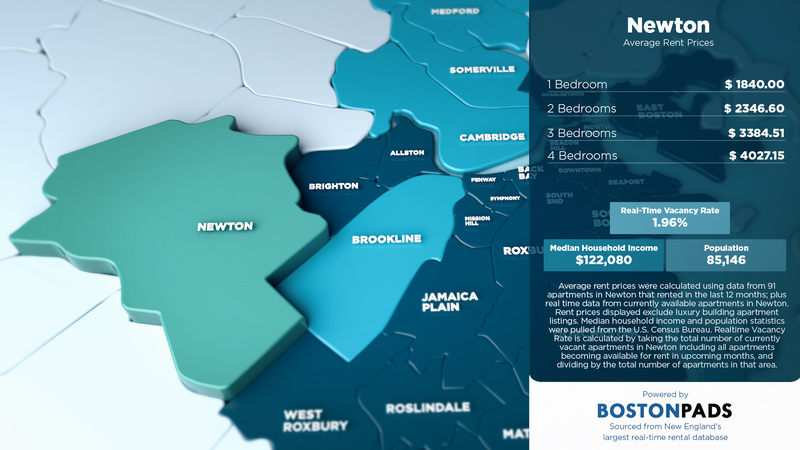 Newton Pads, together with Boston Pads, put together an infographic to demystify rental price trends in Newton. Boston Pads supplied the data from its massive database of over 156,000 Greater Boston apartments, 500,000+ apartment photos, and 8,000+ video tours. The average rent prices were calculated from 91 Newton apartments rented within the past 12 months or still listed. The real time vacancy rate was determined by adding the total number of apartments currently available and any units becoming available in the coming months, then dividing by the total number of units in Newton. The population and average income data was sourced from the U.S. Census Bureau. Average rent prices in Newton hover below those of Brookline, a town that borders it. However, rents in Newton are, on average, significantly more affordable than neighboring Brighton. For example, a studio in Newton costs, on average, only about $50 less than one in Brighton, but $100 less than a studio in Brookline. As apartment sizes increase, the differences become more pronounced. A 1-bedroom apartment in Brookline costs renters more than $250 more than a comparable unit in Newton. But, in Brighton, renters pay about the same for 1-bedrooms as those in Newton. For 2-bedroom units, Brookline renters pay an average of $450 more than their neighbors in Newton, while Brighton renters may budget for nearly $200 less. This trend continues all the way up to 5-bedroom units. Data on average rent prices was collected for 22 geographic areas in Greater Boston. Newton ranks lower on the list for smaller units than larger apartments, but does not exceed the 9th highest average for any apartment size. Studios and 1-bedroom apartments in Newton rank 16th highest in average rent price. The ranking moves to 13th for 2-bedroom, 10th for 3-bedoom, and 9th for 4- and 5-bedoom apartments. All this suggests that while Newton is relatively affordable for the Boston area, renters may not get as much of a bargain as they would in other areas by living with roommates. 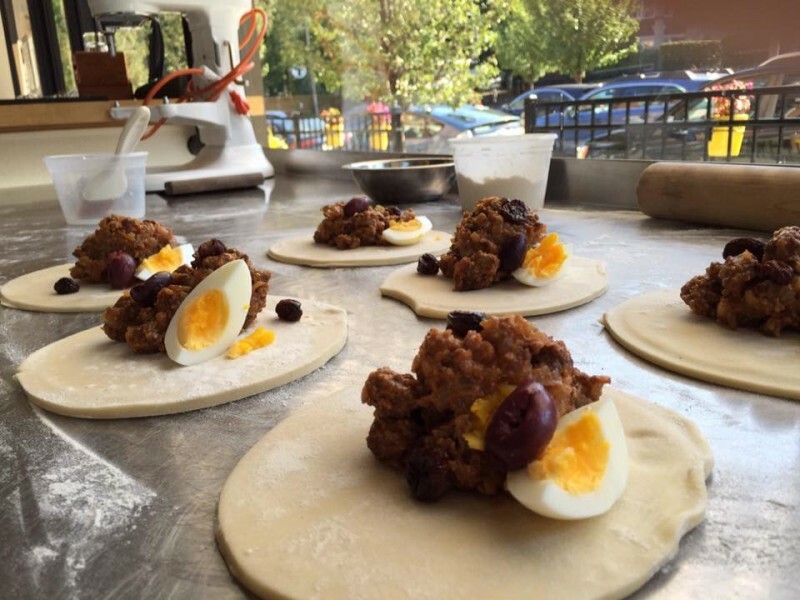 Powered by the Boston Pads database, the largest real time rental database in the region, Newton Pads is a multi-purpose real estate portal serving Newton, MA. The data shown on this infographic and similar data for other parts of Greater Boston is all available by phone every day of the week. Callers, who might be landlords, renters, or anyone interested, will reach either a trained staff member or licensed real estate agent. Landlords may call to get detailed information about the rental market in a town, city, or Boston neighborhood, including current apartment prices, vacancy rates, and more. This empowers landlords to maximize rental income and minimize vacancy times in their properties. This hyper-local, data-driven philosophy has allowed Boston Pads to build a local landlord network 16,000 strong. When landlords list with Boston Pads, they receive the best marketing coverage available from a single source. Boston Pads posts listings to more than 80 locally optimized rental websites, nearly every national listing platform like Trulia, Zillow, and Craigslist, and over 100 local social media pages reaching users on Facebook, YouTube, and Twitter. With the most widespread marketing coverage and the latest data, Boston Pads distinguishes itself as the real estate and information technology leader in New England. Agencies and landlords are welcome to use the Boston Pads platform, which offers tools to help beat the competition. This suite of technologies is scalable with companies as they grow and can adapt to any market. To see average rent prices for more parts of the Greater Boston Area, see a Boston Pads infographic on average rent prices in Boston by town.